In addition to the 3 question survey mentioned in the previous post, please consider providing more detail by participating in our longer survey. It is approximately 25 questions. You will be directed to that survey by clicking here. Thanks everyone! The response so far has been great. How's Your Service? Let Us Know! After you have answered these 3 questions, consider digging deeper. We have a 25(ish depending on your answers) question survey to help us get a clearer picture. 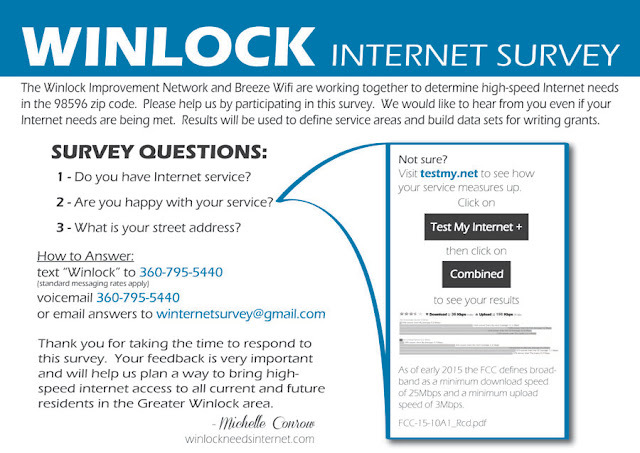 Click Here to be directed to the Winlock Internet survey on Survey Monkey. We didn’t get the news we wanted from ToledoTel or CenturyLink at the meeting on April 8th. We are moving to the next step. It is time for each of us to start filing complaints individually to the FCC. Mark Velasco has filed the first complaint and received a ticket number. He has a contact at the FCC who will be following the complaint and watching out for additional complaints from Winlock. Filing a complaint against CenturyLink with the FCC is pretty straightforward. Click here for a link to the online form. CenturyLink will be served with your complaint directly from the FCC. They are required by law to respond in writing and cc: the FCC with their response within 30 Days. The more complaints they receive, the more pressure it will put on CenturyLink. Please note, this is not a complaint to CenturyLink customer service. This will be handled by a special department within that company with regards to their potential violation of Federal laws, specifically the Open Internet Order of 2015. If I would have known there were so many issues with their service, I wouldn't have signed up or would rather wait until the issues are resolved. When I signed up, I was never informed that I wouldn't have enough speed to accomplish my work, or have the inability to download movies. 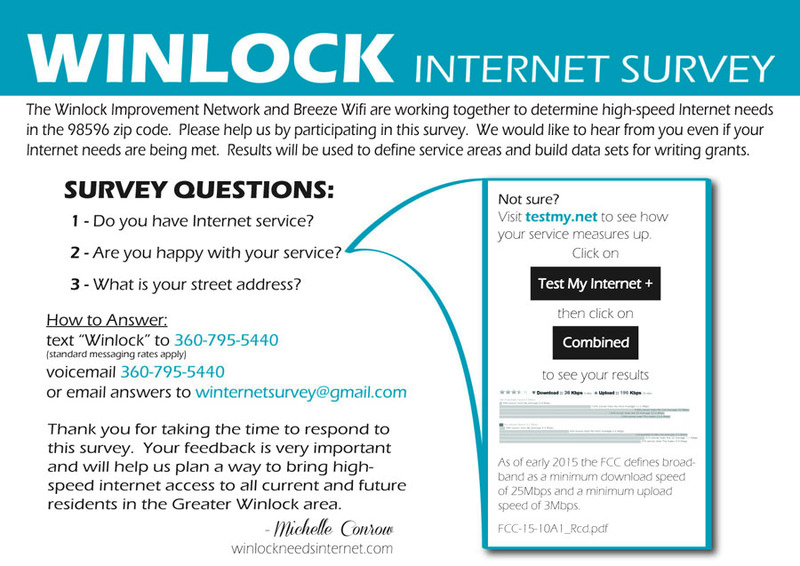 If you need help, please reach out the internet group here in Winlock and we'll do what we can to help you. 4. Find out if there is a chance high-speed Internet might be a public utility in the future and, if so, what we can to do help bring that about. Private industry is failing us. So far we have organized a community effort, Winlock Needs Internet (www.winlockneedsinternet.com), and are working with residents to map out internet problem areas (see enc. 2). We tried to determine what help the FCC Connect America Phase II funds accepted by CenturyLink mean for our area but have not been able to get an answer to date. We looked to ToledoTel, an ISP in the next town over, for help but they referred us back to CenturyLink (see enc. 3 & 4)*. We have been investigating alternative ISP methods including microwave (impeded by trees and hills of which we have plenty), satellite (expensive, slow) and are now looking into utilizing abandoned UHF frequencies (whitespace) which will require creating our own non-profit to fund and operate. At a community meeting on April 8th attended by ToledoTel COO Dale Merten and CenturyLink rep Brad Althauser we learned that funding for 1 Gig fiber optic service in Toledo is not something that can be replicated in Winlock. We learned due to a minimum 20-30% natural loss over out-of-date copper lines CenturyLink cannot provide the 1.5 Mbps access current customers pay for. (Average reported speeds are closer to 50% of services paid for). We had reports of denial of service confirmed. Increased demand has created an over-burdened system and CenturyLink is denying new account requests. Buyers are now asking about Internet access before buying, impacting a housing market still struggling to recover from 2008. Mr. Althauser told us improvement was unlikely. Winlock cannot give the company a substantial return on investment. He gave us options including selling bonds thereby raising property taxes or crowd sourcing private funds to improve CenturyLink infrastructure. We are a small town with over 50% poverty facing a billion dollar corporation that just accepted hundreds of millions of dollars in federal money. Customers paying full price on less than half the promised service are being told the only path to improvement is to subsidize CenturyLink. We thought that was what the FCC CAPII funds were for. We have tried solving this on our own and now realize we face a task requiring the knowledge and support of more influential entities. Any help would be greatly appreciated. *enc 4 references the most recent article in the Chronicle about the ToledoTel/CenturyLink meeting. 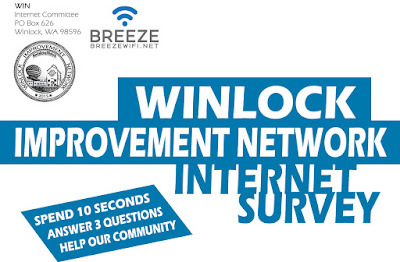 "In impressive numbers, citizens of Winlock came together at the Winlock Community Building on April 7th to address the problem of high-speed internet around the area. While citizens for the most part inside of the city limits have high speed internet through CenturyLink, many outside the city limits and in the surrounding areas are cut off from this due to bandwidth limits. The meeting was much anticipated and it was shown in the enthusiasm of the crowd who eagerly wanted to speak to the representatives of ToledoTel and CenturyLink." Click here to read the full article. 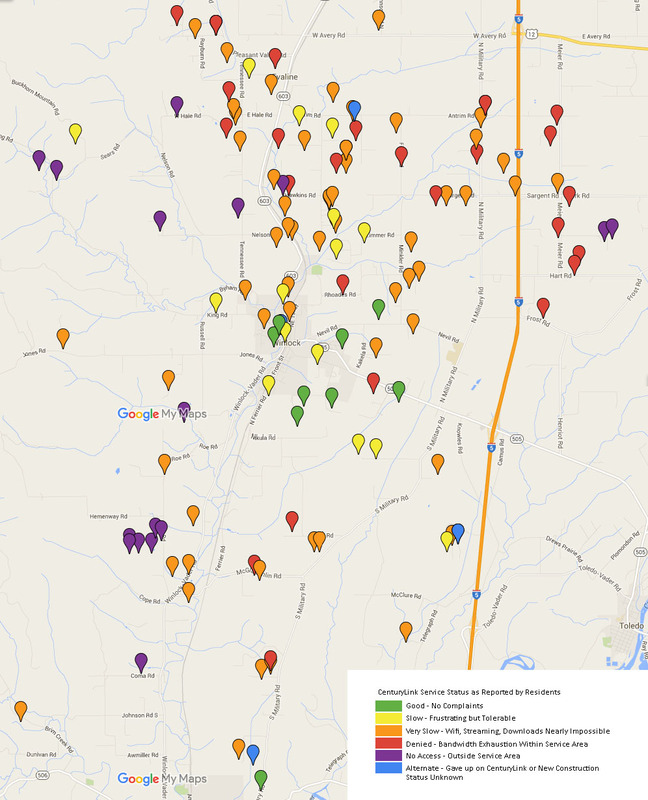 With 139 households having responded so far, this is what our resident reported service map currently looks like. 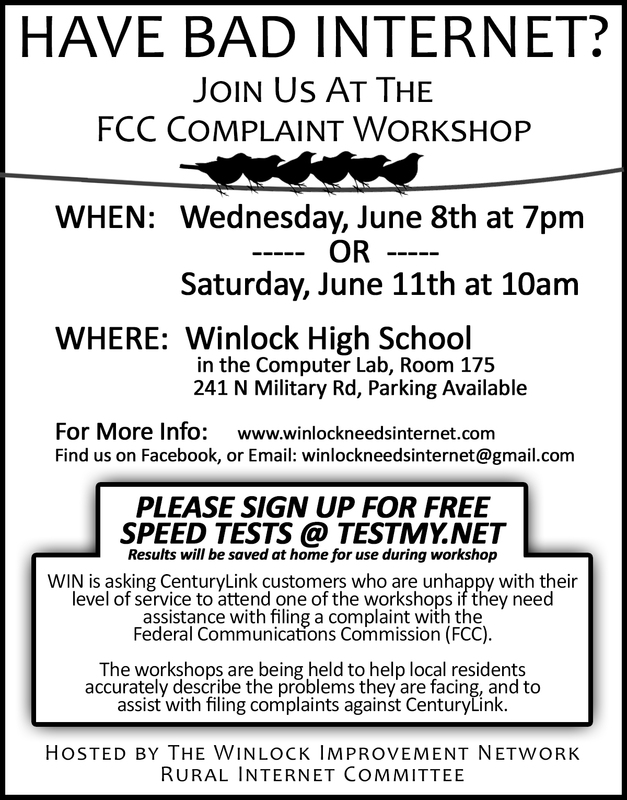 New to "Winlock Needs Internet"? Do you have Internet service? If so, who is your provider (CenturyLink, Hughesnet, etc.)? "Broadband has gone from being a luxury to a necessity for full participation in our economy and society - for all Americans." This leads us to expect a closing of the digital divide between urban and rural Internet access in the near future. We aim to make sure that CenturyLink does not overlook our area and spends some of the funds received from Connect America right here.